Excample for Pi with pump-loop and cgm-loop log files. Beyond just services, such as IFTTT and Papertrail, there are times where your mobile device can provide more access to your rig. The apps described below can help you login to your rig (both at home and while on the road) to make edits, run commands, troubleshoot, etc. There are many scanning apps for iPhone. iNet or NetAnalyzer (lite version...don’t need to pay for this to work) will scan the network that the phone is using for other connected devices and their IP addresses on that same network. So, if you run the scan while your phone is on a wifi network, the scan will be for the wifi network and range will likely be 192.168.1.1 to 192.168.1.254. If you have your rig connected via mobile hotspot, then the scan will be for devices in the mobile hotspot range of 172.10.20.1 to 172.10.20.20. (IP address ranges depend on the type of network being scanned.) Some people have had more success with the NetAnalyzer app over the iNet app, depending on their router settings. Open the iNet app and click on the big NETWORK SCANNER. 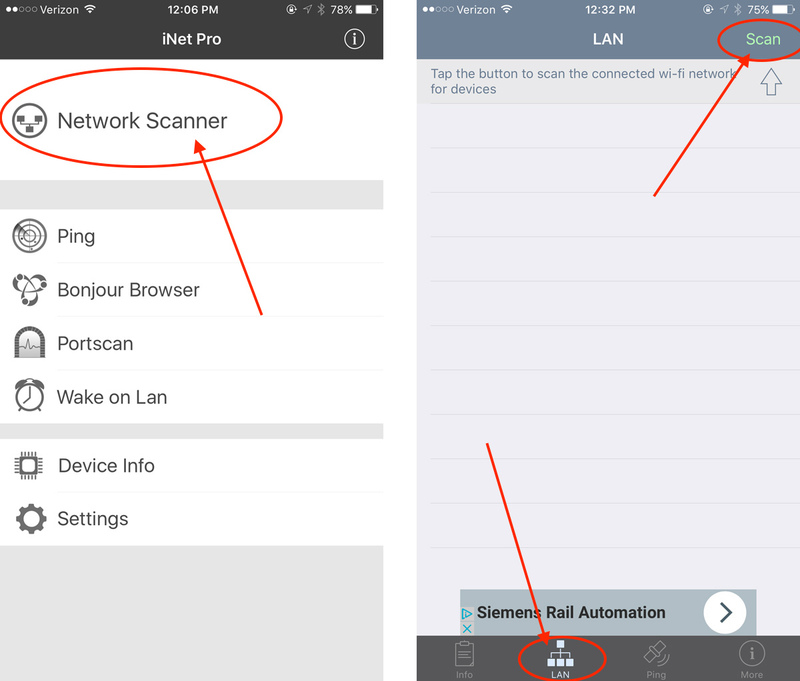 If using NetAnalyzer app, click on the LAN button on bottom bar and then scan button in top right corner of app. The app will begin scanning the network that the phone is currently connected to. In this example, a home wifi network. Scan the results for your rig’s name. If you don’t see the name, try using the other app. If you still don’t see your rig’s name, it’s possible that the rig is not actually connected to the network being scanned. Check the other options (such as papertrail or your home router) to verify whether the rig is actually online with the same network you are scanning. Now you have your rig’s IP address...a valuable piece of information. 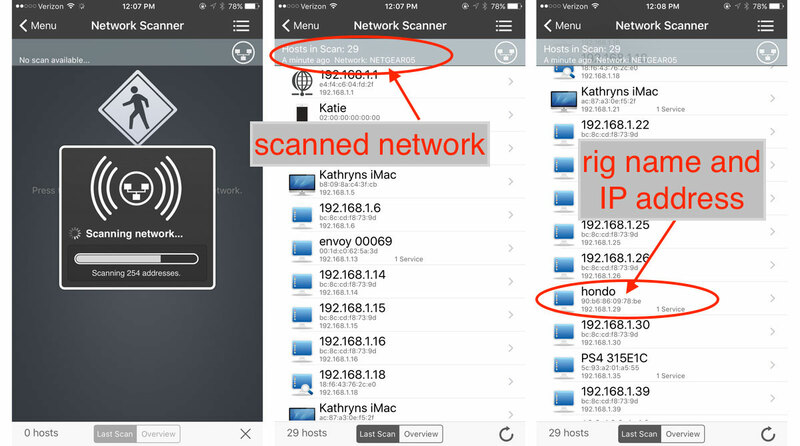 If the rig is connected to your iPhone’s hotspot, the scan will be performed for the mobile hotspot range. You can always re-do a scan by clicking on the little circle arrow in the bottom left of the iNet screen, or the scan button on the top right of NetAnalyzer app. 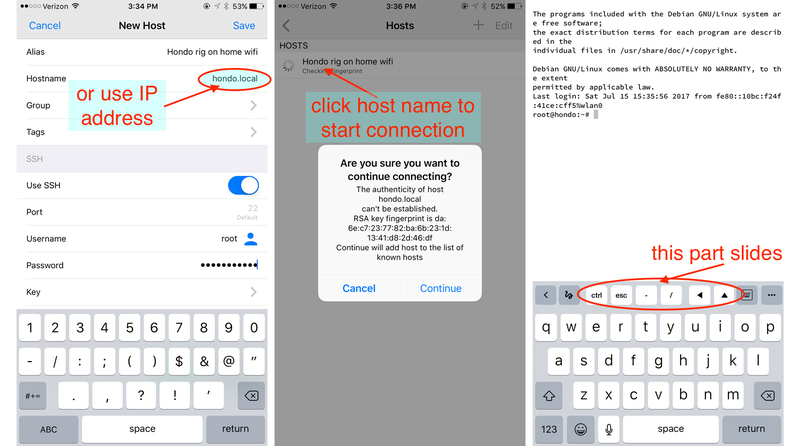 There are many apps that will allow you to use an ssh command to login to your rig wirelessly. These apps make it super convenient to login to your rig while on the go running errands, laying in bed on a Saturday morning, or other situations where you may not want to get to a computer to login to the rig. In order to use these apps, your rig and phone must be on the same internet connection or paired and connected over BT PAN So if your rig is on your home wifi network, your phone must also be logged on to your home wifi network. The SSH connection also works when your rig and phone are properly paired and connected over a BT PAN. If they are not on the same network, you will get a login error. I’ve tried a few apps, both paid and free, and these have been my favorite two iPhone apps; Termius and SimpleSSH. Each has its pros/cons, and therefore I pick which app based on what I’d like to do in the rig. Termius app has a FAR BETTER file editing ability...as in don’t even bother trying to edit files (like preferences.json or adding wifi networks) in SimpleSSH. However, if you want to navigate files on your rig or issue commands that you’ve preprogrammed, SimpleSSH is better. So, if you’re doing an activity which involves editing files...definitely stick with Termius app. Click Save in the upper right corner. You should now see the host you just created. If you click on that host, you’ll see a message that it is connecting (first time connections will ask if you want to save the rig to known hosts, cick continue and then you’ll be connected to a terminal app screen. You can now issue commands and edit files just like you can using Putty or Terminal app on your computer. HINT: In portrait orientation, the middle part of the upper keyboard row can be moved/slid left or right using a fingertip drag. The arrow navigation keys may need to be dragged to see them all in that row. Unlock your phone’s orientation, turn your iPhone sideways and the keyboard will be more prominently shown. SimpleSSH has a few more bells and whistles than Termius app. Namely, you can navigate the folders and files using a touch screen (similar to windows explorer or Mac finder) and you can setup scripts to be run with touch of button (to save yourself typing). However, SimpleSSH has terrible file editing (vi editor will crash and nano editor is pretty much unusable). Authentication - choose password type of authentication and enter your rig’s root password. Click Save in the upper right corner. You should now see the host you just created. Underneath the host, there are two icons; one with a little >_ terminal prompt and the other is a folder with magnifying glass. The first icon is for logging into your rig and using the terminal app (much like the Termius app access provides). The magnifying glass folder is for navigating your rig’s directories and files. If you click on one of those folders, you’ll see a message that it is connecting (first time connections will ask if you want to save the rig to known hosts, cick continue and then you’ll be connected. If you chose the terminal prompt, you’ll be sent to the terminal screen. If you selected the magnifying glass, you’ll be dropped in the rig’s folders/files. One of the best features of SimpleSSH can be found on the Commands page (swipe right on the SimpleSSH home screen to see the Commands page). You can add scripted commands to this page to give you single-button-press access to common rig interactions...like setting up shortcuts. 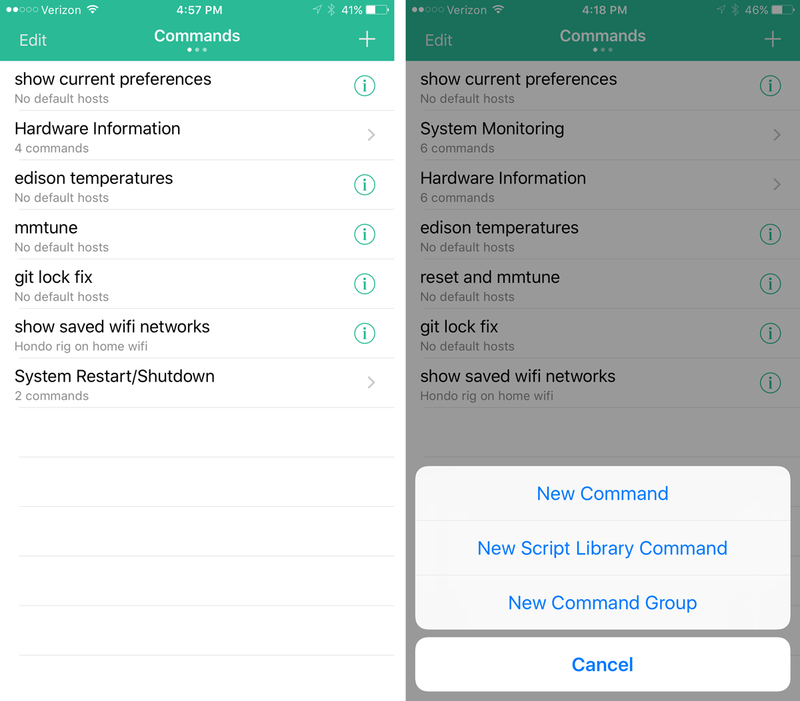 There are pre-scripted commands that come with the app...you can see those by pressing the + in the upper right corner and then selecting New Script Library Command. You can click on the circled down-arrow to the right of the command name to save it to your commands page. Show Disk Status will run df -h which shows available memory on your rig. If you ever have memory errors, this would be a helpful tool to see where your memory has been going. Show Current Version will run the equivalent of uname -a and show which version of the Linux kernel your rig is running. This can be useful in determining your Jubilinux version. Show USB Devices will run lsusb and can help confirm your dexcom receiver is being properly recognized when plugged in. Show External IP address will run ifconfig and show your rig’s wifi (wlan0) IP address or hotspot (bnep0) IP address. Hosts - I recommend leaving this one blank, and instead you’ll be prompted which rig (aka host) you’d like to run the command on when you use it. Show current preferences - Sometimes I just want to double check what my preferences.json file has saved to it. Setting up this command gives me a print out of my preferences.json file with just a single button press. For this command, simply enter cat-pref in the command script body. git lock fix - Probably the most common error in a rig is the .git lock error that happens on occasion and by deleting the .git directory, you can get back to looping quickly. For this command, enter rm -rf /root/myopenaps/.git in the command script body. Edison temperature - If you are ever concerned that your rig may be overheating, you can use this command to read if your edison cores are reaching critical temperatures. For this command, enter sensors in the command script body. This app is useful for logging into the rig via a terminal session when not near a computer or using offline looping, can be done via USB serial cable, bluetooth or wifi depending on your setup. Simply selecrt the connection method using the drop down box and type in the rigs connection details. For SSH use the format root@yourigname/ipaddress:22 This app will use the same commands as other terminal session apps such as PuTTy. There are a few useful apps for viewing and maintaining your Nightscout site. This one is pretty self-explanatory. You can access your Nightscout site by either using the Nightscout app, or by using your NS URL in a mobile browser. If you use an Apple watch and want to view your Nightscout site on the watch, give Glimpse Web Pages app a try. Logging into your NS site isn’t a frequent need, but sometimes helpful when you need to redeploy your site, restart your dynos, add or change configuration settings, or check NS status. You can use a browser to login to your Heroku account, but an app can make the process simpler by saving your password and providing an easier viewing screen for mobile device. LePhant app costs about $5 in the iPhone app store, but provides a really slick way to access your Heroku controls. Frontail is a Node.js application for streaming logs to the browser. It’s a tail -F with UI. To install frontail, just call npm i frontail -g.
For a test run you have to call frontail /var/log/openaps/pump-loop.log and visit <your rigs name>.local:9001 or <your rigs IP>:9001 in a browser. The browser will show you the same output as the command l does. To make this serves always available, you have to start frontail on startup in daemon mode. To do so, add frontail with your desired options to /etc/rc.local bevor the exit call.